Congratulations Andrea!! Please email me at picsnpages@verizon.net and I'll get your prize package out to you!! 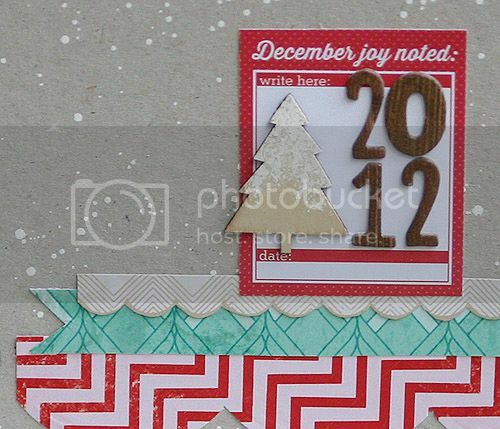 ....and here's a little sneak peek of my latest project, my 2012 December Daily using the super cute Sleigh Ride collection from Crate Paper. As always, thanks for stopping by and have an amazing weekend! Love the splats and the white on the tree. Can't wait to see the rest of it. Ooooh, LOVE Sleigh Ride! Can't wait to see more! Looks awesome Mary Ann!! I Have got to get motivated to get mine started!! Love your sneak! That looks like a lot of fun!!! Love the preview-can't wait to see more of it! Anything with turquoise and red together has to be amazing. That turguiose and red look so striking together...The cover has sort a crisp look to it!